“I Was Here Sheet Music” by Beyonce, “ I Was Here Sheet Music” for Piano / Vocal/ chords , Original key: E Minor, number of pages sheet music PDF: 3, Video and Lyrics song I Was Here Sheet Music. “I Was Here’” is a song recorded by American R&B recording artist Beyoncé from her fourth studio album, 4 (2011). “I Was Here” is a downtempo R&B ballad that is instrumentally based on synthesizers undercurrent, indie rock guitars, musical keyboards and big drums provided by Tedder and Kutzle. The sound of the song’s recurring hook uses a combination of a xylophone and a piano. 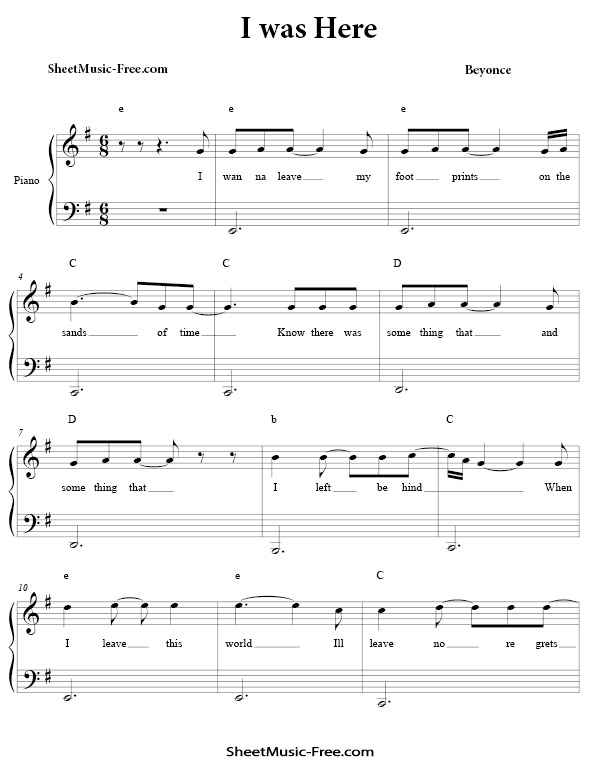 According to the sheet music published by Alfred Music Publishing at the website Musicnotes.com, “I Was Here” is written in the key ofE minor with a 6/8 time signature and has a tempo of 37 beats per minute. The song follows a chord progression of Em–C–D–Dsus–Em–C–Em–C, and Beyoncé’s vocals span two octaves from E3 to E5. I Was Here Sheet Music Beyonce.